This document provides a step by step guidance when delivering media files to Discovery Networks Denmark. Mediabank AdEx provides the easiest and most reliable asset transfer in the market. You will be guided trough the process with predefined forms to secure that mandatory information is provided and correct. By choosing this method the AdEx application will check if the Aspera plugin is loaded and active. If yes, you will see the below message in top of your screen. By choosing this method you simply use your standard file transfer functions in your browser. If you get tired of this option you can "Save choice now and skip later" in which means that it will remember your credentials and skip straight to next screen as shown below. 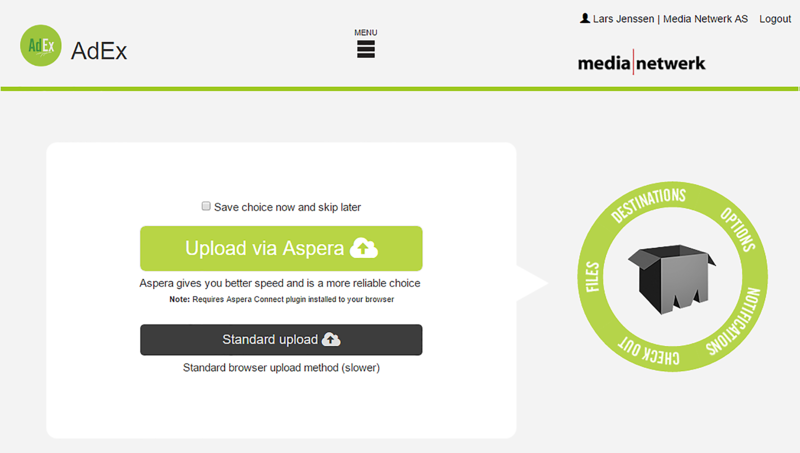 After you have selected the Aspera or Standard upload you will find yourselves located in the below image. And since you have selected this document you already know that "Deliver Broadcast content" is the way to go. Click on the green area to the right with the text Add files . Observe: The green wheel to the right is not documented since the input and selections are handled by the DND selected schemes it selves, when delivering the broadcast content. When you are done clicking on the green Add files and finished selecting your Media file (or files) you will see something similar to the below menu. Destination: Again, select Discovery Networks Denmark since this is your destination. Type: Selecting Discovery Networks Denmark (hereafter described as DND) provides two options in the drop down menu. Tag: If you have filled in your correct Media Id then the Tag field will open a whole new set of additional inputs fields for entering your metadata. At this point you can click on + Add more files to load them into the Upload queue or just continue to fill in the TAG scheme for the present mediafile. If you have selected multiple mediafiles for the same destination and they share much of the same Metadata, you can check the box "Apply to all files" at the end of the first mediafile Tag scheme. All the other files will then be pre-filled with the first file metadata relieving you for the tedious identical schematic inputs. You must however go in and verify each mediafile Tag scheme to avoid false duplicates. At some point you may have selected the wrong media file for upload and you wish to remove it. Just click on the Xall the way to the left of the file name and it will be removed from the upload queue. The original media file is not deleted. If you should try to speed up the transfer with attempt to bypass the TAG process by clicking on the CHECKOUT button you will be prompted by a message like below. Clicking on the Tag entry will reveal all the input field necessary to fill inn before the media file is checked out and ready for upload. You will probably see one of the below schemes in expanded view dependent of the "Type" you selected. This document will focus on "Program Master". Check the heading In the upper left corner in the TAG scheme to secure you have the correct media file "Type". As you can see below there are different schemes for each medial file type. If not already expanded, just click on the Media Information text to continue. Based on your obtained Media Id you attached to the media file, you will find the retrieved media information automatically filled in. Ensure that it is correct before you move on to next step. If you find the information contain errors you should contact your local administrator before proceeding further. If you feel a need to check the technical specifications you can find the documentation in the related articles. Look for DND Delivery specs or click on the "Technical specifications" in the TAG scheme. Depending on the specifications, the media file will undergo an automated technical control but even a manual control by the Mediabank managers. The next step is information of a more general character. Clicking on Notification list will open a drop down menu of available predefined lists. Select the list that contains the recipients you wish to notify. There is no present need to select a list since the TAG scheme contains the relevant recipients by default. You may read more about Notification lists in the related articles. The production company that is responsible for the production and the delivery. They will also be the recipient of the invoice from this delivery. Select the correct production company from the drop down folder. Here you select the name from available post production companies in the drop down folder. It could also be the same as the Production Company. Enter the name of the participants in this program that is of interest to DND. It is a required input and the participants will be a part of the media files metadata. Fill in a description about this revision (version) vs. previous revision. (Not technical information). You can expand the text area window by dragging the lower right corner down and/or to the right. Select from a drop down menu for all spoken languages that need subtitling. Norwegian is already selected as default. Additional information about subtitling can be entered here. Check the box and enter additional information around the dialog in the distorted area. If the Media delivery contains more than one part, then fill in the media start details and the total end of the media including all video parts. Click "+ Add another" for each additional Media part. If the media asset is destined for Dplay streaming service only, you must check this box. The Audio EBU Loudness R128 standard is by default selected and conform with DNN & DND specifications.. This is the place to write down any technicality issue, information about the delivery or Media issues. It could also be that part of the media deliberately have very distorted colors or similar. Press Done when ready and that will take you back to the opening screen. Your TAG button contains a "check mark" and you are ready to click on the CHECKOUT button. Read the terms & conditions and click inside its check box. You still have an opportunity to make changes to your delivery by pressing "Go to Files", otherwise click in the Confirm Checkout box and you are done.